Are herbicides a cause for allergies, immune incompetence and ADHD? Fruit flies fed on organic raisins, bananas, soy, and potatoes, lived significantly longer, had much higher fertility and survived longer after starvation than those fed non-organic foods. —From Chhabraet al, 2013). For more detail see: Live longer-Enhance fertility and increase stress resistance-Eat organic foods. After a year of practicing stress management and changing to a totally organic food diet, to my own surprise my nut allergy totally disappeared. –-25 young woman (Peper, 2015). Many people report being allergic to gluten, nuts, cat hair, etc, or have hay fever or some form of autoimmune disorder. In our 2014 survey 36% of 264 students at an urban university (average age 24.5 years) reported having allergies (Peper and Del Dosso, 2015 unpublished). Over the last forty years more and more people are reporting allergies. Allergies are often dismissed because they are not a serious—just uncomfortable and may limit what you eat or where you visit (e.g., I can’t eat a morning bun or I can’t visit my aunt because she has a cat). In rare cases it may trigger life-threatening allergic reactions (anaphylaxis). By injecting a single dose of epinephrine using an EpiPen,® it helps the body override the allergic reaction for a short period of time. This allows people who are suffering anaphylaxis some time to get emergency care. Epinephrine does NOT resolve allergic reaction. Other drugs, such as antihistamine and steroids, are required to suppress the reaction while the body metabolizes the allergen. This usually takes many hours and people typically have to stay in the hospital for 8-24 hours to be monitored for their safety. Allergies and autoimmune illnesses have become so common that we forget that they may be markers of immune incompetence and may affect the ability of the body to optimize health. The increase in allergies is an early indicator that something harmful is affecting the body. People who have allergies, autoimmune illnesses, diabetes or other disorders are possibly the “canaries in the coal mine” for the rest of the population. In earlier times before carbon monoxide and other poisonous gasses could be measured with instruments, miner used a canary as a poisonous gas meter. If the canary died, the miners would exit the mine before they would die of the poisonous gasses. There are many factors that contribute to the radical increase in asthma, rhinitis, allergies, Type 2 diabetes and autoimmune disorders. These include excessive hygiene, lack of breast feeding and introducing foreign foods too early in the first year of a baby’s life, ingestion of acetaminophen (Tylenol) by the pregnant mother and during the first year of baby’s life, low Omega 3 levels during pregnancy, increased exposure to plastics and other endocrine disruptors, stress, etc. Many of these factors are outside of our control; however, diet and the ingestion of residual herbicides and pesticides in food appear to be a major risk factors. In the last thirty years there has been a radical change in our diet. The food may look and even taste the same, yet it is totally different. Almost all grains, corn, soy, processed foods, and meats contain low levels of Monsanta’s herbicide Roundup® and other herbicides and pesticides. Almost all grain, corn, soy and cotton are now genetically modified crops and herbicide tolerant to Roundup®. Roundup® was first introduced in 1974 by Monsanto and is the most widely used herbicide for farm and urban use. The active ingredient is glyphosate with numerous other inert ingredients which may also be harmful to humans. According to the US Department of Agriculture, as of 2012, 99% of durum wheat, 97% of spring wheat has been treated with herbicides. It is also used on rice, seeds, alfalfa, dried beans and peas, sugar cane and sweet potatoes (Swanson et al, 2014). As Roundup® and equivalent herbicides are used more and more, numerous illnesses including food allergies have increased. 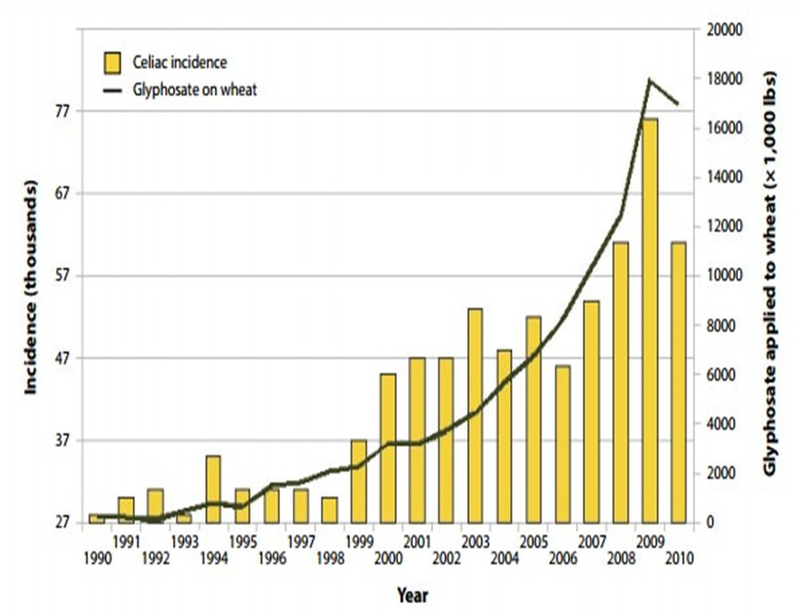 For the correlation between celiac disease (gluten intolerance) and glyphosate use see Figure 1. Figure 1. The correlation between increase in celiac disease (gluten intolerance) and increase of the use of the herbicide glyphosate (Roundup®) on the genetically modified grain (From: Samsel, A., & Seneff, S. 2013). Presently, more than 95% of all grain, corn and soy as well as cotton is genetically modified to be herbicide tolerant as shown in Figure 2. Figure 2. 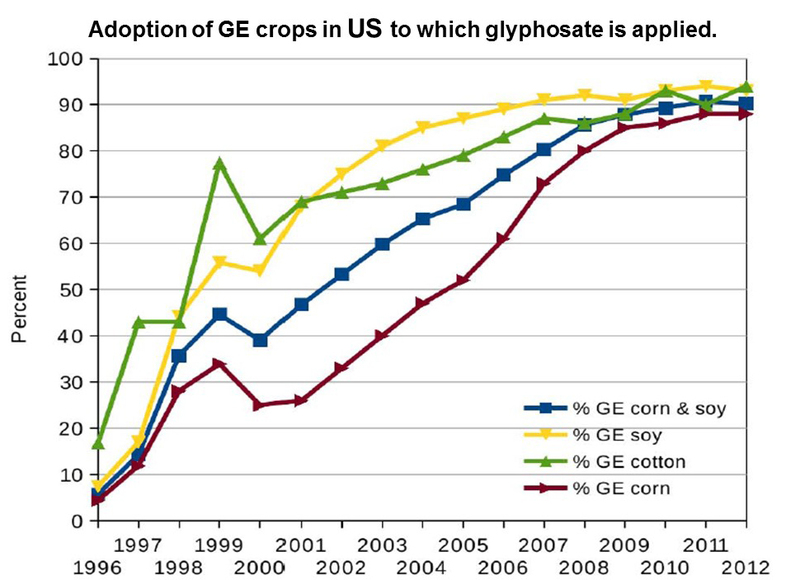 Adoption of GE crops in US to which glyphosate is applied. Reproduce with permission from: Swanson, N. L., Leu, A., Abrahamson, J., & Wallet, B. (2014). Genetically engineered crops, glyphosate and the deterioration of health in the United States of America. Journal of Organic Systems, 9(2), 6-37. In the USA glyphosate is the most widely used herbicide and about 250 million pounds are applied to U.S farms and even lawns every year. In addition, the common wheat harvest protocol in the United States is to drench the wheat fields with Roundup® several days prior to harvesting. This allow crops to dry down for an earlier, easier and bigger harvest (Swanson et al, 2014; Sarah, 2014). Glyphosate and the many other herbicides and pesticides are in our food, animal fodder and thus in the meat, clothing, water supply and even air. Almost all human and animal food now contains low levels of glyphosate and its inert but poisonous additional ingredients which may impact our health. The increased application of glyphosate with the increase of chronic diseases over the last 35 years correlates highly (great than 0.9) and is highly significant for obesity (R=0.96), diabetes (R=0.98), end stage renal disease death (R=0.97), Crohn’s disease and ulcerative colitis (R=0.94), death due to intestinal infection (R=0.97), autism in children (6-21 years) (R=0.99), deaths from senile dementia (R=0.99), and death from Alzheimer’s (R=0.93). Figure 3 and 4 shows the relationship between diabetes, autism and glyphosate. Figure 3. 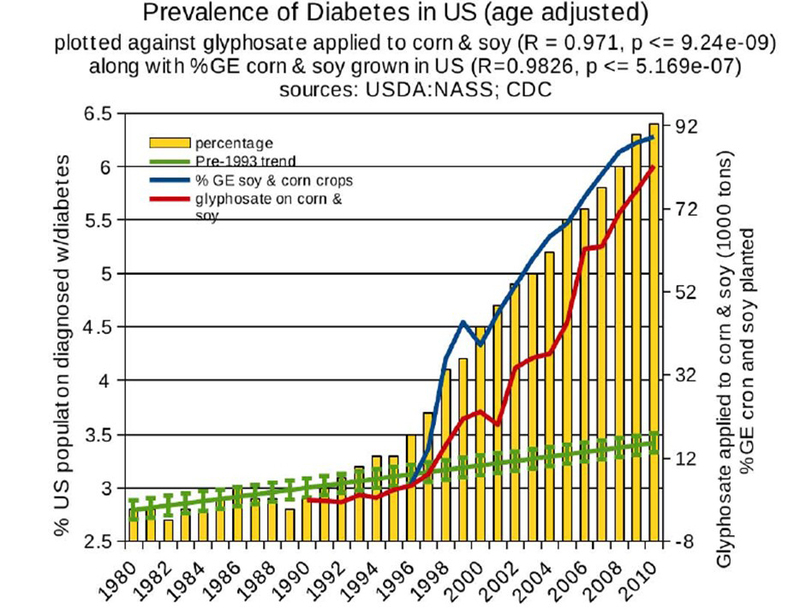 Correlation between age-adjusted diabetes prevalence and glyphosate applications and percentage of US corn and soy crops that are genetically engineered. Reproduce with permission from: Swanson, N. L., Leu, A., Abrahamson, J., & Wallet, B. (2014). Genetically engineered crops, glyphosate and the deterioration of health in the United States of America. Journal of Organic Systems, 9(2), 6-37. Figure 4. 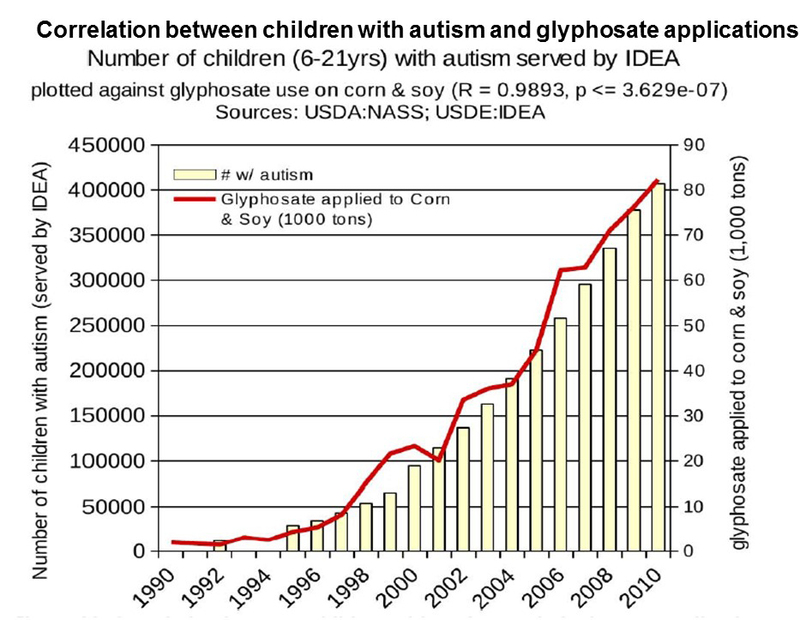 Correlation between children with autism and glyphosate applications. Reproduce with permission from: Swanson, N. L., Leu, A., Abrahamson, J., & Wallet, B. (2014). Genetically engineered crops, glyphosate and the deterioration of health in the United States of America. Journal of Organic Systems, 9(2), 6-37. Correlations are not proof and similar correlations could be plotted between these illnesses and increased production of plastics, intake of high fructose corn syrup, computer use, cell phone use, antidepressant and ADHD medications. Correlations may suggest relationships that should be investigated. Correlations may suggest possible relationship which should be investigated. It is very difficult to investigate the correlation because most people unknowingly have ingested glyphosate. When using naturalistic observations such as comparing people who eat organic versus non-organic foods, there are many other variables that could account for the differences. Roundup® residues in food is harmful is from a biological perspective. The purpose of using glyphosate and its inert ingredients is to act as a herbicide and biocide to suppress weed growth and act as a drying agent to improve harvest. As human beings are biological organisms, glyphosate affects our cellular metabolism and especially our bacteria that live in our gut and are necessary for our health. As Samsel & Seneff, (2013) point out, ‘it kills the beneficial bacteria in our gut, leading to the steep rise in intestinal diseases.’ Specifically, Shehata et all (2012) found that “highly pathogenic bacteria as Salmonella Entritidis, Salmonella Gallinarum, Salmonella Typhimurium, Clostridium perfringens and Clostridium botulinum are highly resistant to glyphosate. However, most of beneficial bacteria such as Enterococcus faecalis, Enterococcus faecium, Bacillus badius, Bifidobacterium adolescentis and Lacto-bacillus spp. were found to be moderate to highly susceptible” (Swanson et al, 2014). Given the very strong correlations of increased disease with increased use of Roundup®, the demonstrated evidence that glyphosate disrupts gut bacteria balance, cellular metabolic processes, kills human embryonic, placental and umbilical cord cells, and acts as endocrine disrupters, the recent decision by the International Agency for Research on Cancer (IARC) which is the specialized cancer agency of the World Health Organization that glyphosate is a possibly carcinogenic to humans (Group 2A), I strongly recommend avoiding glyphosate and other types of herbicide and pesticide contaminated foods. Use the precautionary principle and eat only organic foods. In summary eat only organic foods when possible and follow the wisdom of numerous countries that have banned the use of Roundup®. This year, the Netherlands followed Russia, Tasmania, and Mexico to ban Roundup®. To understand more of the hidden dangers in our food supply from genetic engineering, herbicides and pesticides watch the following impressive videos by Robyn O’Brien presented at TEDxAustin 2011 and MIT researcher Dr. Stephanie Seneff describing in detail the politics and the harmful physiological impact of glyphosate. Peper, E. (2015). Thinking out of the box with biofeedback for the treatment of psychogenic non-epileptic seizures, vulvodynia, and CIN III carcinoma in situ cervical dysplasia. Paper accepted for the 46th Annual Meeting of the Association for Applied Psychophysiology and Biofeedback, Austin, Texas, March 11 – 14, 2015. Peper, E. & Del Dosso, A. (2015 unpublished). Skipping breakfast a risk for blanking out on exams. Samsel, A., & Seneff, S. (2013). Glyphosate, pathways to modern diseases II: Celiac sprue and gluten intolerance. Interdisciplinary toxicology, 6(4), 159-184. I wonder if this can also lead to feelings of exhaustion, sometimes unmerited. I also wonder about the heavy metals that remain in our bodies from these toxins and how it affects us. There are many possible effects and causes. From this perspective use the precautionary principle and avoid foods that contain herbicides, pesticides and heavy metals. Also avoid environments in which those are present.